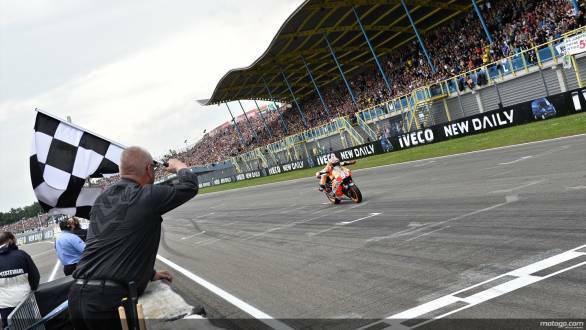 Marc Marquez continued his unbeaten streak, winning an exciting premier class race at the TT Circuit in Assen, Netherlands. This time around though it was not just the likes of Valentino Rossi, Jorge Lorenzo and team mate Dani Pedrosa who would battle with the championship leader. The weather too was part of the proceedings this weekend with rain and hailstones added to the mix earlier on in the day. The race start itself was a frenzy of uncertainty with no one sure enough to decide whether to go out on to the drying track with wets or take the gamble on slicks. Rossi took this a step further than anyone else, going out on the warm-up lap with slicks. This proved to be an unfavourable choice and he immediately came into the pits to switch to his second bike with full wets. This also meant he had to start from the pits. Out on the grid everyone else went with the more obvious choice of wet tyres though also knowing that as the track dried quickly and if the rain stopped, they'd be coming back in to switch bikes again. Alex Espargaro started off from pole but soon fell back as Andrea Dovizioso and Marquez hit the front. Espargaro kept up the pace though and continued to battle with Pedrosa in a hotly contested third place battle. Soon after the start of the race, the rain abated and the drying track meant that on just the fifth lap, the riders started to come in to change bikes. Marquez was nearly caught out with the tricky conditions and ran off the track, leaving Dovizioso in the lead of the race. He passed him in a flash and soon headed off into the distance to take his eighth straight win and equaling a record set by Giacomo Agostini in 1971. Dani Pedrosa also managed to pull away from Espargaro to finish third while Rossi put in a stellar performance working his way back from dead last to fifth. Rain played a part in the Moto2 race as well but it was veteran Anthony West who managed to just make it over the line ahead of Maverick Vinales and Mika Kallio. The action packed race was actually delayed by 20 minutes due to heavy rain that started on the sighting lap. The difficult conditions saw a number of spills as riders went down one after the other but when the dust settled, Johan Zarco and Alex DeAngelis managed to keep it together to finish in fourth and fifth respectively. Alex Marquez again gave the Marquez family another reason to celebrate, winning the Moto3 race and repeating the result in Barcelona. Marquez started well from second on the grid and led for most of the race. He was challenged by team mate Alex Rins but he was able to pull away in the end, finishing a cool three seconds ahead of Rins. Rins in turn won an exciting battle with Miguel Oliveira, beating the Mahindra Racing rider in the final stages of the race. Alexis Masbou and Niccolo Antonelli ended up in the top five in the Moto3 class.